This topic contains 9 replies, has 2 voices, and was last updated by Jason Jones 1 year, 6 months ago. I am looking for a way for entries to be attached as a PDF in addition to or in place of ‘content’ within an email text. this would make it easier to save ‘entries’ on our computers. Will this software do that? I am having trouble deciphering through he demo. Yes, this plugin will work for your needs, however, you must create the PDF “form” with Adobe Acrobat Form Fields and upload the PDF to the plugin, then map your Formidable Form to the PDF with the plugin’s EXPORT tab. Got it! so if I understand you correctly… This plug in only does PDF fillable forms. taking entries and filling them into PDF for you. THEN my workaround would be to create a fillable PDF and have my entries map into that. When your subscription rates say “up to 40 forms”. Does that mean that 40 different forms can map to 40 different PDF forms? 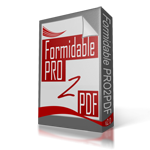 It means 40 different “Formidable” forms can map to an unlimited number of PDF forms. All plans can map to an unlimited number of PDF forms. If I purchased the 1 Site / 40 Forms level. Does this mean that I can have 40 different forms export data to 40 different fillable PDF’s an unlimited amount of times? I am confused what the 2nd data set means. I am afraid that I will only be able to provide 2 different types of Fillable PDFs for 40 different forms to insert data into. The 2nd dataset option is to merge two formidable forms into one PDF form using a single shortcode. – Incorrect. With the 1 Site / 40 Forms subscription you may upload an unlimited number of PDFs, and merge them an unlimited number of times, from a maximum of 40 Formidable forms. FYI — TO CONFUSE YOU EVEN MORE — At your request, the SITE/FORM count of any plan may be mixed and matched. For example, you may request a change to your 1-SITE | 40-FORM subscription to be a 11-SITE | 30-FORM subscription, or you can change a 1-SITE | 10-FORM subscription to a 3-SITE | 8-FORM subscription, etc..